I had wanted to code something in HTML5's Canvas for a while, and of course, I decided to make a little game. pick up items such as food and medicine - click on the corresponding icon. The keeper will walk to it and pick it up. He can only hold one item. feed animal/administer medicine - click inside of an animal enclosure. The keeper will automatically feed the animals in that enclosure, or administer the medicine, depending on what is being held at the time. Note: when standing close to an animal enclosure, you can inspect the diet of the respective animal, in order to learn what to feed them. Note: some foods are harmful to certain animals! The game doesn't keep score. 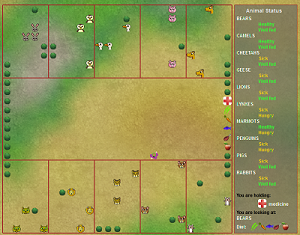 It's more like a simulation in that sense, but I think it is still fun to try to keep your animals happy. They will get sick and hungry quite fast. Be on your toes! The game is based on the Canvas element in HTML5. I've made a few attempts to add sound as well, but had very poor results, and which varied wildly between browsers. You can download all game files locally (the directory can be accessed freely, listed, etc. ), and tweak the code as you see fit. In particular, game balance constants are found at the beginning of globals.js. The game works with Firefox 3, Firefox 4, and Internet Explorer 9 (click 'Allow blocked content'). The game does not work with Ice Weasel 3. Compatibility with other browsers is unknown.